I had so much fun making snow globes at Christmas that I wanted to make more. I thought that these would be fun for Valentine's Day too. I originally wanted to find a cupid figurine, but couldn't, so I made my own with my trusty Silhouette SD. I chose to use cupid Design ID #15816 from the Silhouette downloads. I measured the lid to my jar and the height of the jar and sized the file accordingly. I covered my lid with washi tape (quicker than painting!). I placed some adhesive pop dots on the lid and stuck cupid's feet to them. This gives him a little height in the jar and holds him in place. 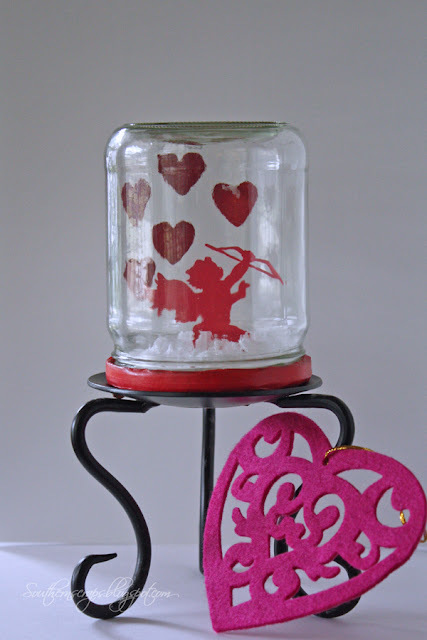 Next punch some red hearts out of cardstock and adhere them with glue dots to the inside of the jar. 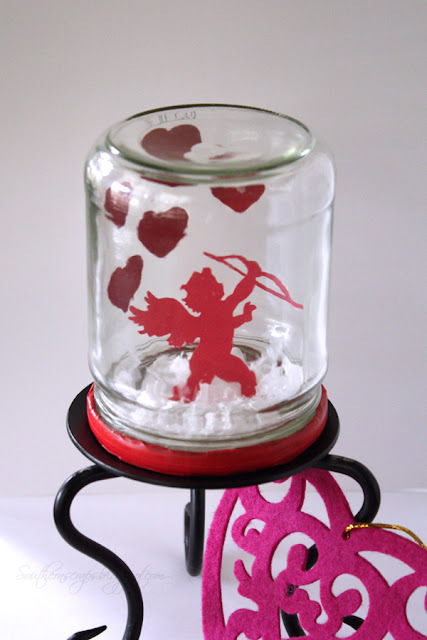 Add some faux snow and place the lip on with cupid attached. Turn upside down and you have yourself a cupid snow globe that "snowing" hearts inside. This post contains affiliate links. There is no hidden cost to you. I earn a small commission if you decide to buy the recommended products. Too sweet! Love it!Thanks so much for sharing! Would love to have you visit me sometime. Oh that is so adorable cute. Seriously, I just might have to make one this weekend. I'm absolutely in love with it! 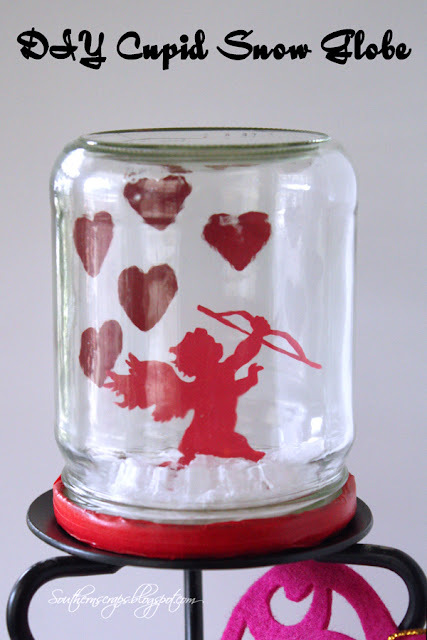 Love the idea of a Valentine snow globe! So cute. My mother in law collects them and would love this. Cute! I still have some winter pinecone snow globes sitting out. I should transform them to Valentine's Day snow globes!